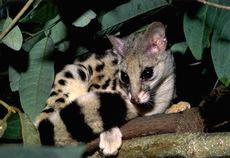 The spotted linsang is a civet species found in the forests of the central and eastern Himalaya. It is short with a slender body, pointed head, pointy ears, and small limbs. The coat is brownish gray with distinct dark patches, and the legs are completely covered with hair. Head and body length is between 14.96 and 16.14 inches. The tail is long and fluffy with ten dark rings and can reach up to 13.8 inches long. Its head is fox-like in appearance, but with a longer muzzle. The eyes are dark and large, enabling this species to see well at night. Spotted linsangs occur in dense tropical forests. They have also been observed in areas with drier conditions. They are active only at night. It is not fully known if they are solitary or if they prefer to remain in groups. Much of the time is spent up in the trees where nests are built in tree hollows. They may also nest under tree roots. The nests are made of dry leaves and twigs. Diet consists of insects, birds, and small mammals. Little is known about the reproductive behavior of this species. Young linsangs have been spotted in February and August. Females may give birth to up to three. The latest population estimate for the spotted linsang is less than 200, making it a rare civet species. Causes of decline include loss of habitat due to logging and agricultural development. Also the linsang is hunted for its beautiful fur. Copyright Notice: This article is licensed under the GNU Free Documentation License. 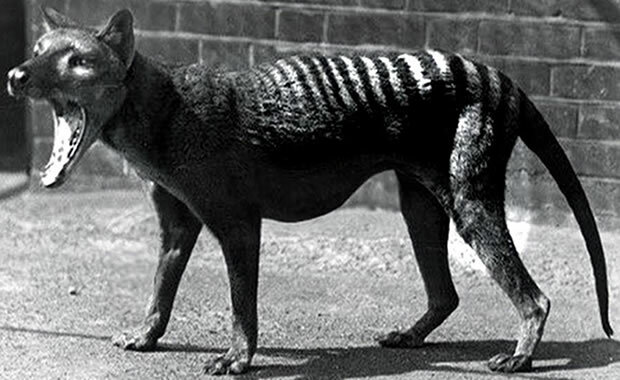 It uses material from the Wikipedia article "Spotted linsang". Glenn, C. R. 2006. "Earth's Endangered Creatures - Spotted Linsang Facts" (Online). Accessed 4/24/2019 at http://earthsendangered.com/profile.asp?sp=238&ID=3. Need more Spotted Linsang facts?